In paintings and video, Daiwa Anglo-Japanese Foundation Art Prize-winner Kate Groobey expresses life’s many delectations as a woman with a female partner. See Pure Pleasure at Mizuma Art Gallery through October 13. As the world continues to grapple with the monsters it’s created, Eye of Gyre unveils 2018 Frankenstein – Art, Science, and Society as Seen in Bioart. Highlights of this exhibit marking the 200th anniversary of Mary Shelley’s novel include Aki Inomata’s 3D-printed hermit crab shells, leather jackets made with stem cell technology, and a reproduction of Van Gogh’s ear. Until October 14. Design Ah! on NHK is an educational children’s show with plenty for adults to enjoy. The National Museum of Emerging Science and Innovation (Miraikan) presents the program’s invitation to “look, think, and create” through a design-based approach that features bright and engaging displays on familiar themes such as food and the body. Ends October 18. The MuPon and Tokyo Art Beat apps offer ¥100 admission discounts. In Uncertain Landscape, five leading artists including Asian Art Award-recipient Chikako Yamashiro exhibit paintings, photography, and videos considering how memory shapes and shakes our concept of place and reality. At Yokohama Civic Gallery, Azamino through October 21. 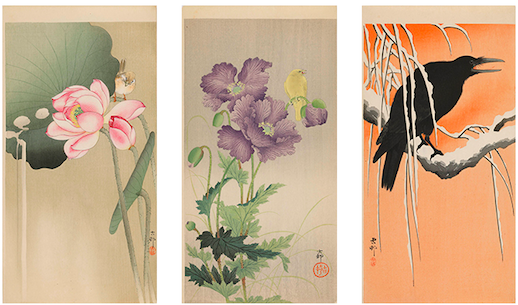 Chigasaki Museum of Art in Kanagawa Prefecture is spotlighting outstanding prints for its 20th anniversary, this time with Koson Ohara – An Eden of Birds and Flowers. The gorgeously vivid works of this early 20th-century printmaker who favored motifs from the natural world have long been favorites of international collectors. Finally they have a chance for admiration at home again with this extensive show. Ends November 4. Kazuko Miyamoto has been creating mesmerizing string installations that experiment with geometry, minimalism, and spatial perception since the 1970s. Head to Take Ninagawa gallery to see how she takes fellow line-obsessive Sol LeWitt’s influence into another dimension. Through November 10. Fall means it’s time for the performing arts showcase Festival/Tokyo. The tenth edition encompasses plays, dance, music, art, and talks in and around Ikebukuro. Thai choreographer Pichet Klunchun’s much-anticipated dance MI(X)G is on this year’s agenda. Cambodia also takes a leading role with “BonnPhum,” a village festival transplanted to Tokyo as a celebration of contemporary culture, and “Fields: Phnom Penh,” which spotlights the capital’s art scene with exhibits and films in English. Japanese speakers can catch performances including Marebito Theater Company’s “Performing Fukushima” and “Radio Pacific,” a theatrical trip on the Toden Sakura tram led by actor Takeshi Fukuda. Oct. 13–Nov. 18. The Museum of Contemporary Art, Tokyo (MOT) remains closed through next spring, but there’s still MOT Satellite, a seasonal reminder that Kiyosumi-Shirakawa’s creative scene is alive and well. Dotted across seven “MOT Spaces” and a variety of local joints like cafes and shotengai shops, the 2018 fall program explores the theme “to become a narrative.” Shows include Nissan Art Award-winner Aiko Miyanaga’s sculptures in a former bookbinding factory, Nozomi Suzuki’s window-glass photography, and conceptual performance artist Dennis Oppenheim’s videos relocated from MOT into town. Oct. 20–Nov. 18. Missing girls in Japan, self-harm in China, vanishing villages in Taiwan, and family portraits in Korea and Singapore are among the subjects of the six women photographers in I Know Something About Love, Asian Contemporary Photography. These topics and their portrayals can be graphic and difficult to face, but the range and mastery of styles––from the documentary-esque approach of Lulu Shur-tzy Hou to the restaged family histories of Geraldine Kang––shine with truth and beauty. Ends November 25. We Used to be More Sensitive at Hara Museum of Contemporary Art is the Venice Biennale representative’s first exhibit at a Japanese museum. Kit is known for his paintings and installations based on objects like tablecloths that blur lines between functionality and artistry. The site-specificity of his work plays in strong and subtle notes at this Bauhaus residence turned into a museum. Ends December 24. The MuPon and Tokyo Art Beat apps offer ¥100 admission discounts.